Margrethe Alexandrine �orhildur Ingrid, Her Majesty The Queen, became Queen of Denmark in 1972. 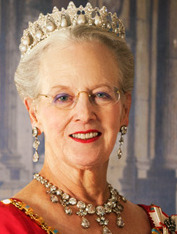 HM Queen Margrethe II was born on 16 April 1940 at Amalienborg Palace as the daughter of King IX (d. 1972) and Queen Ingrid, born Princess of Sweden (d. 2000). The Queen�s motto is "God�s help, the love of The People, Denmark�s strength". HM The Queen was christened on 14 May 1940 in Holmens Kirke (the naval church) and confirmed on 1 April 1955 at Fredensborg Palace. The Act of Succession of 27 March 1953 gave women the right of succession to the Danish throne, but only secondarily. On the occasion of the accession to the throne on 14 January 1972, HM Queen Margrethe II became the first Danish Sovereign under the new Act of Succession. Please see this film cut, in which HM The Queen talks to Piet van Deurs about the accession to the throne in 1972. On 16 April 1958, the Heir Apparent, Princess Margrethe, was given a seat on the State Council, and the Heir Apparent subsequently chaired the meetings of the State Council in the absence of King Frederik IX. On 10 June 1967, the Heir Apparent married Henri Marie Jean Andr� Count of Laborde de Monpezat, who in connection with the marriage became HRH Prince Henrik of Denmark. The wedding ceremony took place in Holmens Kirke, and the wedding festivities were held at Fredensborg Palace. HRH Crown Prince Frederik Andr� Henrik Christian, born on 26 May 1968 and HRH Prince Joachim Holger Waldemar Christian, born on 7 June 1969. HM The Queen attended Zahles Skole during the years 1946-1955, from 1946 to 1949 as a private pupil at Amalienborg Palace. In the period 1955-1956, HM The Queen was a boarder at North Foreland Lodge, in Hampshire, England. Having received private lessons, Her Majesty graduated from Zahles Skole with the upper secondary examination certificate (language line) in 1959. Next followed the years from 1960 to 1965, when HM The Queen studied at universities in Denmark and other European countries. After having passed the examination in philosophy at Copenhagen University in 1960, HM The Queen studied archaeology in the period 1960-1961 (Diploma in Prehistoric Archaeology) at University of Cambridge. Her Majesty, subsequently, studied political science at Aarhus University in the period 1961-1962, at the Sorbonne in 1963 and at the London School of Economics in 1965. HM The Queen�s mother tongue is Danish. In addition, Her Majesty speaks French, Swedish, English and German.